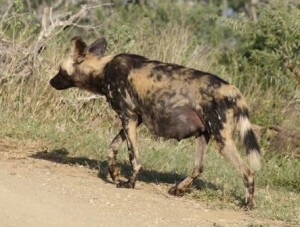 In late January 2011, a second field season of monitoring free-ranging populations of wild dogs commenced. The field work is taking place in the same reserve as 2010, namely the Hluhluwe-iMfolozi Park (HiP), South Africa, where study of the previous packs with updated demography, reproductive success and pack dynamics can continue. Upon arrival, it was quickly established that the number of packs in the park was the same as that from Aug 2010; however, the composition of the packs had changed quite a bit with the addition of pups from the previous year. From the five packs that produced pups, four had successfully reared at least 50% or more over the past 6 months, thus increasing the population at HiP overall. By mid-February the breeding season had begun with at least two packs showing mating behaviour. Similar observations were seen in several other packs in March and April. The start of May has seen two packs begin the denning period and this will be followed by up to four more packs in June and July. As in previous years, faecal sampling remains the main priority of this project, whereby important information regarding reproductive and stress hormones can be obtained. As analysis of these samples continues, interesting results between individuals and packs are being revealed. This in turn will hopefully provide further understanding of wild dog reproduction, as well as assist management in determining factors which may influence this success. The continued growth of the HiP population is a result of successfully breeding and rearing of pups by several packs, in addition to the monitoring and careful management by HiP staff. However, although natural mortality will keep the population fluctuating, the need for further research, awareness and education remains. Mortality resulting from human factors like snaring and road accidents continues to affect many wild dog populations not just in South Africa, and without improved practices to prevent this, wild dog conservation will remain difficult.